If you're like me and like to fiddle with things, this page is for you. You could buy a BBQ, bring it home, assemble it and fire it up. It will work just fine in most cases. You will notice over time that things may not be a functional as you'd like. For instance there seems to be a lot of smoke escaping from around the lid, or things don't cook easily. Take it a step further and maybe you'll wonder if you're losing a lot of heat from the vent and could it be more efficient? While these modifications apply to specific cookers, they should give you some ideas about how you can improve what you use. Reviews are subjective and are my opinions, your mileage may vary. I'd review more cookers, but I only have so much money, so if someone wants to send me theirs to review, I'd be happy to do so. Did you hear me Traeger ? If you already have the Char-Griller 2222 Pro Deluxe Charcoal Grill & Smoker you can purchase the Side Fire Box separately. Your best bet is to purchase them together locally due to the weight. I was initially interested in this smoker because of the solid construction, cast iron grate, and the fire box for offset smoking. It is a heavy piece of metal to move around and put together. Over time I've found myself using it less and less unless I need a large cooking area. It isn't terribly efficient and seems to consume a large amount of briquettes to keep the temperature constant. I find myself using the upright barrel type smokers more often because of their size and efficiency. It took awhile to put this monster together due to the heavy metal. It helps to have two people, especially when adding the firebox. Seasoning is pretty standard using lots of vegetable oil on the interior and metal grates. I found through trial and error and reading some of the links below in the modification section that the performance and efficiency could be improved. These changes helped a lot in the charcoal consumption, but due to the large surface area, a lot of heat is lost in both the firebox and main body of the smoker. This smoker does a good job at smoking large amounts of meat. I've put two turkeys on at once. I found that rotating them is a good idea as one side is hotter closer to the firebox. It really isn't worth firing it up for a chicken or a pork loin. I use one of the smokers below that is more efficient. You definitely need the modifications below to make this a good smoker. Smoke is added by tossing a small amount of pre soaked wood chips to the charcoal. The Char-Griller Pro does a good job of barbequing and grilling using the suspended adjustable coal grate. If you're cooking for a lot of people doing hot dogs and hamburgers, the surface area works well. Chicken can also be done, but requires more attention and adjustment of the grate level and coal position. I purchased the rotisserie attachment for the Pro (I don't believe this is sold anymore which probably says something about it). It works well in general, but the motor is a bit weak and struggles with larger things like turkey. The heat is difficult to control if you're using the grate below and flare-ups are a problem. Overall, I don't think it is worth the money unless you are really willing to play with it. I've seen these units at several local stores including Lowes. They are often on sale as either a package of Pro and Firebox or separately. Due to the weight, it is better to buy locally to avoid painful shipping costs unless you can get free shipping. Amazon's price is normal for the Pro, although their prices on the Side Fire Box is about twice as high as it should be. You can purchase from the Char-Griller site, but the shipping is higher than Amazon (usually free on large purchases). pit to make it more efficient. These are based on the Char-Griller Smokin' Pro with the Side Fire Box. Get some small thermometers from Lowes or Home Depot BBQ or use this link for a great smoker thermometer , and set them at either end of the body of the grill just below the lid level. There are holes predrilled at the right location. I found some perfect ones that allow the probe to pass through the hole and a threaded shaft and nut placed just right for attachment. You can easily monitor the interior temperature at the grill level on both sides. You can cover the holes with tabs of high temperature flue tape when not in use to keep in heat and smoke. 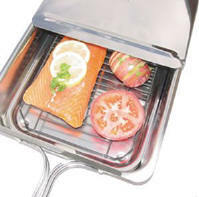 The top vent in the Char-Griller lets out all the hot air. Hot air rises so you need to lower the vent pipe to at least the grill level. Get some 3" semi-rigid dryer vent pipe . Slip the vent over the internal projection of the vent pipe and form the vent to the outside of the top cover. I cut off the vent pipe at the right level so the edge wedges against the inside lip of the lid. I took the top warming rack out as I rarely use it. This has held securely without any clamps or drilling. You'll see an improvement in consistent temperatures and lower your fuel consumption. You can use the leftover piece of vent pipe to extend the top pipe as well. Putting a curve in it allows you to direct the smoke away from you and better control the temperature. Another option would be to drill and cut a hole in the side opposite the firebox below the grill level and attach vent pipe running up from there. You'll have to stabilize the vent pipe well as it has nothing to attach to above the lower section. I have had good luck with lining the inside of the lower section with heavy foil and adding two bricks set on their side with a foil drip pan. This does several things. Reflects the heat back from the lower area. Makes for easy cleanup. The bricks retain heat and keep the interior temperature more stable (I've also heard of adding ceramic briquettes for the same purpose). The drip pan sits up a bit higher and acts as a baffle. Use some sort of charcoal basket in the firebox. I've seen people make them of a variety of materials. I've tried a couple different options and they work very well. It keeps the coals more closely grouped and hot and makes it easier to slide out the tray below to empty the ash on a long cooking session. Try this product to make your own trays or baskets. The Orion Convection Cooker, uses indirect heat to produce convection current within the cooking cylinder, produces amazingly fast cook times, moist tender meat and worry free cooking, 100-percent stainless steel. Unit is heated by charcoal, no expensive fuels or hot oil is used. Smoke flavor comes from wood chips placed at the inside bottom of the cooking cylinder. 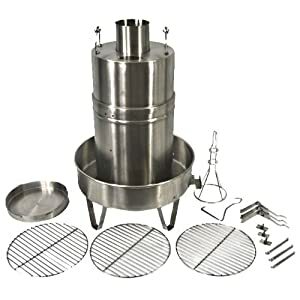 Dimensions Assembled 19.75" x 36" x 13"
Carton Size 21" x 20" x 21"
Smoke flavor comes from wood chips placed at the inside bottom of the cooking cylinder. Since you don't want to open the cooking cylinder while cooking, I assume you need to add a larger amount to generate sufficient smoke throughout the process. This doesn't appear to be a good function of this cooker. The Orion website has some good information with general specifications, an Assembly Manual, replacement parts list included grill, and the ability to order them separately. You can purchase the cooker from a quite a few places, but Amazon seems to have the best price. The only mod so far is drilling three holes in the side to run a barbeque thermometer probe through. You can cover the holes with tabs of high temperature flue tape when not in use. 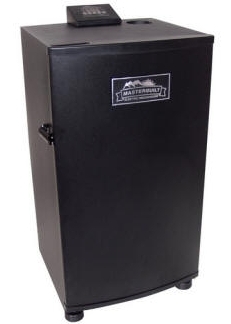 This Masterbuilt Smoker , has more than 1.7 cubic feet of total smoking capacity and a variety of easy-to-use features, the Masterbuilt 30-inch Electric Smokehouse Smoker sets the standard for slow-smoked BBQ. The smoker is designed to appeal to smokers of all skill levels, from novices to experts. To use, simply plug in the smoker, set the temperature and timer, load your food, and sit back. The smoker does the work for you, making it easy to wow your friends and family with delicious smoked turkey, sausage, and pork. 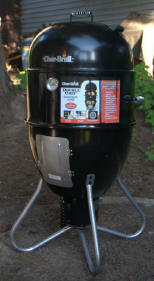 Several other models of Masterbuilt Smokers are available including charcoal, propane and gas and variations in style. The smoker is spacious inside, with four interior smoking racks that offer more than 730 square inches of combined cooking surface. As a result, you'll have ample room for your ham, fish, sausage, chicken, or jerky--enough to feed extra-large crowds on special occasions, holidays, and family reunions. Also, you needn't bother opening the door to add more wood chips, as the smoker offers an easy-to-use side wood chips loader. 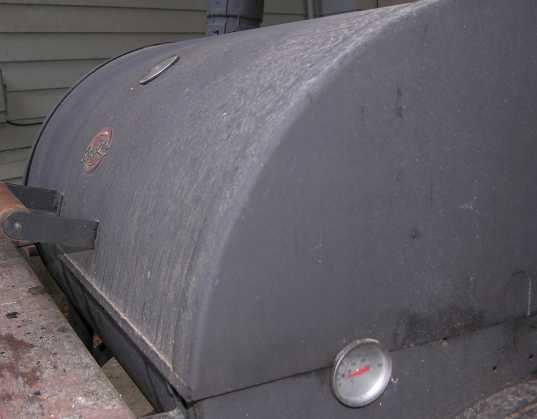 Simply fill the loader with your favorite wood chips, slide it into the side of the smoker, and watch it smoke. Cleaned all the metal parts with white vinegar and then soap and water. Ran it up to full heat (275). Seemed to take awhile. About 2 hours with the air temperature at about 60. Loaded the smoke tray and let it run for an hour. First time out I brined and then dry rubbed two chickens. There is more than enough room. I could probably put at least 4 chickens in the available space. I filled the smoke tray twice with wood chips during the 4 hours using the convenient side loading wood chip loader. I used my barbeque thermometer after about 3 hours to monitor the meat temperature. It sits easily on top and the door closes easily over the cord with no problems. When it hit 170, I pulled them out and let them rest. They were done perfectly, meat still firm, but close to falling off the bone. Good smoke flavor that was even stronger on the leftovers the next day. Second test was with a pork picnic roast. I used a basic pork brine (water, salt, brown sugar, garlic) for 12 hours and then some basic pork rub . I filled the water tray with surprise, water. I have not found that adding other stuff makes an appreciable difference though I do throw in some rosemary from time to time. Again, preheating to 275 took about 2 hours. I put the meat on the second tray from the top and removed the top tray. I reset the temperature to 210 and set the timer for 10 hours. I put the thermometer probe on the tray to monitor internal temperature and check how accurate the digital temperature was working. I secured the door and filled the smoke tray loader with hickory wood chips. Update: The temperature seems to be running about 10 degrees low from the relatively accurate thermometer. I set the digital temperature to 220. I'll continue to monitor. The Masterbuilt website has some good information with general specifications, an Assembly Manual, replacement parts list included grill, and the ability to order them separately. I am toying with the idea of putting up a small solar panel and a marine battery with an inverter to power this unit. This model appears to be discontinued, but you can still get some parts. I spotted this smoker at a local store and it caught my eye because it looks like the Big Green Egg in shape. The Big Green Egg is a ceramic smoker that costs an arm and a leg, but produces good results. I've considered it, but the ceramic is fragile, especially in a wet climate with big temperature swings. What looked attractive was the shape that allows heat to rise to the large surface area. The sections come apart for different configurations allowing grilling with close contact to the coals, barbequing allowing some distance and smoking with a water pan. When I first saw it in the store I looked it over carefully, took a picture with my Blackberry and then did some research on the web. I couldn't find any reviews so it must be a fairly new product. I decided to take the plunge and buy it as my Brinkmann smoker was getting a bit long in the tooth. Dimensions Assembled 41.5" x 25.75" x 25.75"
Carton Size 20.75" x 20.75" x 15"
The primary selling points were the larger cooking area (much larger than most barrel smokers), legs, raising the smoker higher off the ground, the removable ash catcher to allow for easy removal during long smoking sessions, a tight fitting lid with a vent for less heat loss. Write down the model and serial number before using the grill. They are on the front of the silver door. I left the larger sticker on the grill and brushed it with vegetable oil. Once the smoker was hot, it pealed off easily. Venting is controlled in the ash catcher on either side and in the lid. The only problem I can see with this setup is the loss of smoke through the top vent. If this proves to be troublesome, I'll look at running a pipe or some other mechanism down to the food surface to trap the smoke. 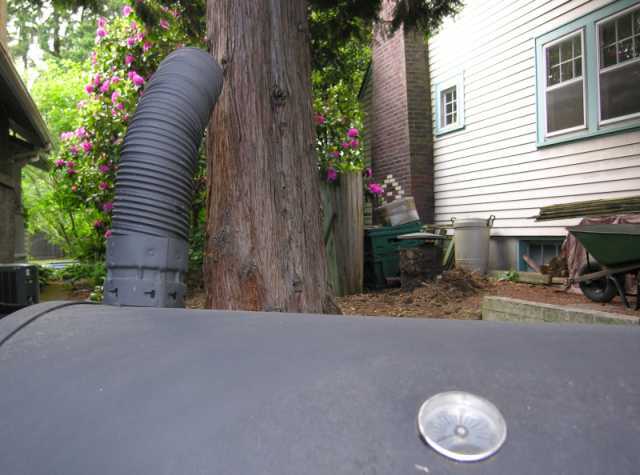 (see modifications above on the vent pipe of the Char-Griller). Another issue is that the water pan sits quite close to the coals, The water seemed to boil away much faster than in the Brinkmann smoker. When you open the side door, the water pan is partially blocking the opening. Perhaps placing the water pan on top the grill surface instead of beneath it will help in both respects. Setup is slow, but not difficult. All you need is a Phillips head screwdriver and a adjustable wrench. The directions don't exactly match up to the parts. The larger brackets go lower on the smoker. Prepping the smoker is covered in the instructions. I coated the inside of the smoker and the grill surface with vegetable oil. I did not put in the water tray as per the directions. I started about 20 briquettes in a coal starter and put them into the charcoal grate. I left the vents on full open and let it sit for about an hour and a half. I added about 10 more new briquettes and was pleasantly surprised to see they caught well and raised the temperature visibly. I let the coals burn out over night. In the morning, most of the ash was in the ash catcher and I brushed the rest down the holes beneath the grate into the catcher. First off this unit is very efficient in charcoal consumption. I can smoke a large turkey on essentially a half a bag of charcoal or less. I start the coals in a coal starter and after that toss in about 6-8 briquettes every hour to keep the heat up. It is a visual check by opening the side door. If the coals are looking low, I toss some in. I took the smoker out on its first run using pork chunks in a Chinese BBQ Pork sauce. Nothing special, I just happened to have all the ingredients at hand. I skipped the red food coloring as I am not sure why it is that color in the first place and doesn't add to the flavor. I soaked the pork for about 2 hours in the marinade. I also presoaked some apple wood chips. I filled a coal starter about 3/4 full and lit them. When they'd turned white I emptied the coals from the top into the coal grate. I filled the water pan with warm water and put it on the lower brackets. This was a bit touchy as the coals were putting out some heat and I was trying not to slosh the water onto them. Perhaps putting the tray in empty and adding water would be better. I did not put the cooking grate over the water pan as it would just get dripped on and not serve any purpose. I put the middle section in place and placed the cooking grate on the upper brackets I then put the lid in place to allow the temperature to get stabilized. I took the meat out of the marinade and place them on the upper cooking grate. I placed a probe into the largest piece of meat and plugged it into my barbeque thermometer base. This is where I ran into a bit of an issue. Because the lid fits over the rim of the middle section, the cord to the probe didn't allow the lid to fit tightly. I drilled a hole in lid to allow the probe to pass through without compromising the lid seal. After replacing the lid, I added some presoaked apple wood chips through the side door. Because the water pan hangs down, it is difficult to distribute the chips. Either raising the pan or using a container of chips would work better. I continued to add wood chips at about half hour intervals. Cooking time was about 2-2 1/2 hours until the pork reached 150 degrees. I did not add any additional briquettes to the original amount. The heat remained constant according to the temperature gauge on the smoker, and was just starting to drop when the meat was done. I was impressed with the efficiency of the smoker. I will check the temperature gauge against one of my temperature probes to see where the optimum smoking level falls. Again a very efficient use of charcoal. You can barbeque at the higher grill level and avoid scorching. No problems whatsoever. The lower grill is far enough from the coals that scorching is reduced while still keeping a high temperature. The grill is large enough to do a good amount of meat. Char-Broil website with specifications for the Double Chef Smoker has some good information with general specifications, an Assembly Manual, replacement parts list included grill, and the ability to order them separately. 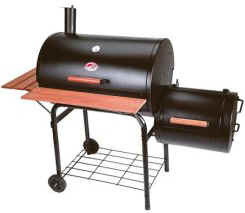 You can also register your smoker with Char-Broil, use the model and serial number on the front of the door. 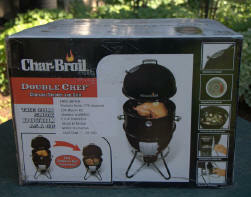 You can purchase the Double Chef Smoker from the Char-Broil site, but the price seems way to high. Check your local stores for better prices. Fred Meyer in Oregon had it for $109.99 marked down to $94.99. They had a coupon for 10% off all barbeques and we had a $10 reward coupon so our final price was $76.49. This is quite a bit better than the $199 plus $10 shipping shown on the Char-Broil site. The only mod so far is drilling a hole in the lid on the left side fairly low to run a barbeque thermometer probe through. This works well as the lid is a tight fit and running a probe under it compromises the seal. I also tightened things up on the door latch as it was coming loose. The charcoal grate has a very low wall and doesn't retain a deep stack of charcoals for extended cook times. A inexpensive, 12-in diameter, 4 inch deep, $2 aluminum roasting pan can be used. Cut the bottom out and set it on top of the cooking grate. This almost doubles your volume, and extends cooking times. Brinkmann Gourmet Charcoal Smoker and Grill with Vinyl Cover, Green from Amazon is about as good a price as any for the utilitarian smoker. The surface area is a bit small for a good size turkey or any larger quantity of meat. 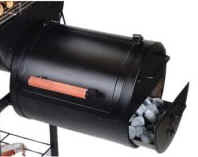 The nice feature of this smoker is the ability to lift off the barrel section with the lid and add charcoal without loosing heat to the meat. It is necessary to knock out some of the ash during a long smoking session to keep the coals going. 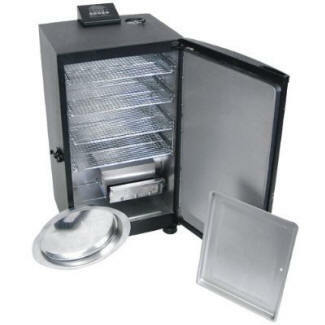 This isn't the most efficient smoker as there is a gap around the lid and body that allows smoke and heat to escape. I start it up with two coal starters and usually add at least one more if not two depending on the air temperature. It also doesn't maintain the temperature as well as other smokers. Wood chips can be added through the front door which gets quite hot so watch your fingers when opening it. As a grill it works about the same as the Smokey Joe below. You just remove the barrel and put the lid on the lower section. You can use less coals and it does an adequate job. It is very low to the ground and bending over is a pain. Overall this smoker works well and I've done some nice smoking on it. Weber Smokey Joe Charcoal Grill is the go to guy for quick grilling like fish, hamburgers or sausages in small quantities. The coals are a bit to close to the grill surface for quality longer cooking like chicken. One full of briquettes is enough to do anything in this small grill. I've had good luck with small quantities of wet wood chips scattered lightly on the coals to add some smoke flavor to the meat. Laying fish on a piece of cedar also works well and adds some good smoke flavor to salmon. 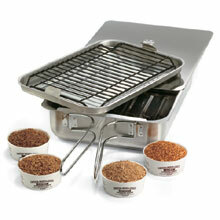 The Cameron Stovetop Smoker is the way to go for quick indoor grilling. The stainless steel box sits on your electric or gas stovetop and cooks quickly and efficiently without a lot of smoke. There is a metal drip pan and a raised grill tray for the food. The cover slides shut easily and fold out handles make for easy storage. The Stovetop Smoker comes with specially formulated wood chips in a variety of flavors and an instruction book with a few recipes. Actually it is more dust than chips, formulated to burn well and provide just enough smoke without setting off your smoke alarm. You only need about a tablespoon of wood chips, any more and the smoke gets out. There are a couple of excellent books with many more recipes. (see below). 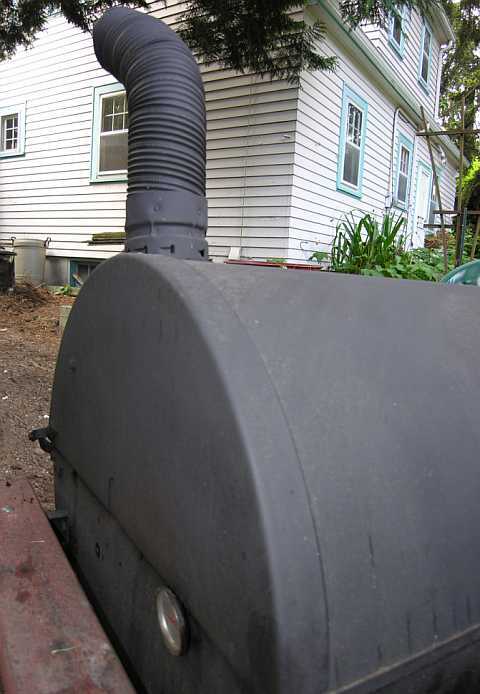 This smoker does an excellent job with meat and many other foods. Salmon has to be one of the best options with either alder or cedar wood. Asparagus is very nice with some smoke flavor as is cheese. Experiment with cooking initially on the smoker and finishing the food on a traditional cooker as well. Options include adding some smoke flavor to a roast before finishing in a crock-pot. Throw some burgers on the smoker for 5 minutes and then finish in a pan or grill. Also experiment with different amounts of moisture to add steam or a dryer smoke depending on the food. Put a tablespoon of wood chips on the bottom of the pan. Cover the drip tray in foil for easy cleanup. Set the drip tray on top of the wood chips. Wipe the raised grill with vegetable oil and set on the foil covered drip pan. Add a few tablespoons of water, cooking sherry or other flavored liquid onto the foil covered drip pan if desired. Don't add to much or you'll steam your food. Set your food on the grill tray. Turn your stovetop on high, leave the lid open or off, and set the Stovetop Smoker on the burner. As soon as you see the first wisps of smoke, shut the top. Cook as desired or per instruction book for different food types in instructions. Don't use to many wood chips or you'll set off your smoke alarm or smoke yourself out of the kitchen. A teaspoon and a half to a tablespoon is enough. Line the drip tray with a layer or two of foil. It makes cleanup much easier. Don't overheat. Turn on high just until the smoke starts and then turn the heat down to medium or lower to cook. If you overheat the smoker, it can warp the lid and tray. Center the smoker on the burner. Don't use two burners. Don't put to much liquid in the drip tray when cooking meat or you'll just steam it. You may not need any as the drippings will provide some moisture. Put thicker cuts of meat or the thicker part to the center of the smoker as the part over the burner is a bit hotter. While cooking, don't grab the handles without some protection. They get hot. The lid gets hot as well, be careful when opening the lid and use a pair of tongs or pot holder. If you're using liquid in the drip pan it creates a lot of steam that escapes when the lid is opened. Be careful. Cleanup is easy. If you coat the grill tray with vegetable oil, it wipes clean. Pull out the drip tray and remove the foil and wipe clean. 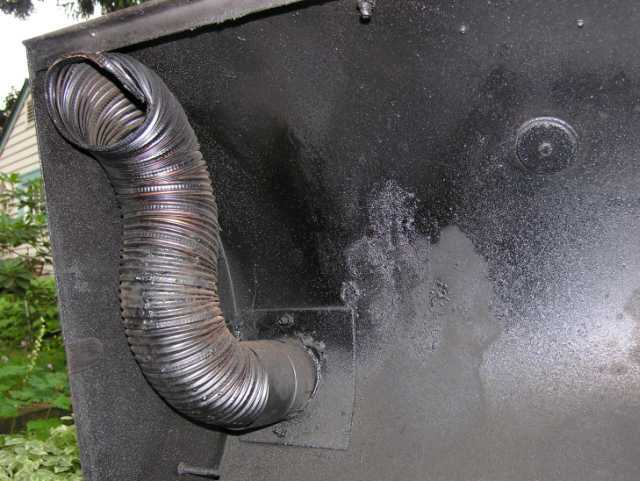 The charcoal in the bottom can be shaken out into the garbage once cooled and the bottom wiped clean. Dry all parts completely before storage. Excellent book with a lot of recipes for your Stovetop Smoker. Steve Raichlen's books are well researched, entertaining and very useful. This one is no exception and provides good instruction and recipes for your indoor grilling. A nice selection of specially formulated wood chips for your Stovetop Smoker. A nice package with a good amount of wood chips and instructions and recipes.